Teaching descriptive writing is one of those things I always look forwards to – what English teacher doesn’t love to use language devices with flourish? – Only to often regret when it comes to marking. In my first couple of years of teaching I was always dumbfounded by the results of what I’d taught; why does this description become a story half way through? Why is it always about vampires? How exactly are his eyes like a fluffy cloud? How can this be 3 sides long and not have any punctuation? That’s until I realised this: to teach description you need to be precise, you need to show good examples and you need students to be able to visualise the scene before they can write about it. I always, always introduce the topic with both an image and an example of description being done well. You can also model an example from the image you show, or create one as a class. I do think it helps to suggest the atmosphere myself and gear the resources and work towards that setting. It avoids confusion and means that everyone is on the same page with their descriptions. By all means let those who want to change genres do so, just ensure they are very clear on the atmosphere they are trying to create. For arguments sake, let us say that we are trying to create a dark and disturbing atmosphere or to mirror the characteristics of gothic literature. To introduce this I would turn out the lights and play an ominous and atmospheric piece of music such as Hector Bernstein’s Symphonie Fantastique but I also wouldn’t judge you for using the start of Thriller or even showing the music video as a warm up activity. Be prepared for dancing, I wasn’t but enjoyed it immensely. Ask the class how atmosphere is created here, what colours can they see in their mind or on screen? What time of day would it be? What smells would there be? How does this link to the characteristics of gothic horror as seen in The Strange Case of Dr Jerkyll and Mr Hyde? Put students into groups of 4 whilst handing around images of dark and derelict buildings, laboratories or cities. Ask one student to describe the scene (without allowing the others to see) whilst they draw it. How close are their pictures to the original? Once they begin to think about how to create a highly visual image in their minds, they can start to plan a way for it to be logical and engaging. This is also exam practise for Paper 1 as they may be given a picture as a prompt. Using Collins’ Student Guide for The Strange Case of Dr Jekyll and Mr Hyde and the novel look at examples of how Dr Hyde is described, ‘pale and dwarfish; he gave an impression of deformity…had a displeasing smile…with a sort of murderous mixture of timidity and boldness’. The description here is both dark and disturbing but also hints at monstrosity and death. More is given away in this sentence to engage the reader. Can students recreate this skill? In order to plan effectively and efficiently students should come up with a 5 point plan using a central image you display to the class, the pictures you have already given out or the image on page 82 of the Collins Student Guide for The Strange Case of Dr Jekyll and Mr Hyde. Ask students to create 5 vivid details from that image and then use each detail as a starting point for their descriptions. I would encourage them to create an order to these images, it could be subtle to dramatic or floor level to ceiling or least worrying to most concerning. Once they have padded each sentence, see if they can also add descriptive language features such as metaphors, foreshadowing as seen in the example earlier, listing, similes or varied sentence structures. Have students peer assess each other’s work at this point asking them to highlight areas that need more developing or suggest ways to make the piece more atmospheric. I wouldn’t be opposed to having a check list of language features here to use for peer assessment or as a reminder when students are writing. Also ensure you are asking students to peer assess for SPAG too as although 24 marks are for content and organisation that still leaves 16 for technical accuracy and you would be amazed at how quickly paragraphs can fly out of the window when students are engaged and writing quickly. By training your students to use this 5 point plan they gain transferable skills to use in their exam as well as whenever they need to write descriptively. Although this lesson focusses on AO5 and A06 I wouldn’t hesitate to use this lesson outline with younger classes, perhaps subbing out Thriller for the opening scene of Monster House or a scene or extract from Harry Potter or Northern Lights. A media lesson could also be created here by replacing the still images with segments from film then asking students to recreate an atmospheric scene using animation software or even recording scenes they’ve created themselves. If you could link cross-circularly with the music department to create soundtracks then all the better. Allowing creativity in this exercise is key to both their enjoyment and to the creation of an engaging piece written with flair and attention to detail. Collins’ The Strange Case of Dr Jekyll and Mr Hyde Student Guide has been designed to improve skills in both English Language and Literature, and help students understand the play’s themes and contexts. Complete with plot and character summaries, end of chapter tasks, and sample responses, the Guide helps prepare students to ace the exam. 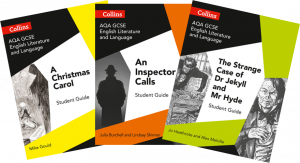 Also available in this series are Guides for An Inspector Calls and A Christmas Carol. 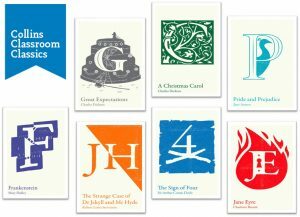 You might also be interested in our new Classroom Classics – the original 19th century novels accompanied by introductions and glossaries to help your GCSE students understand the context in which they were written. Just £1.50 each for schools!